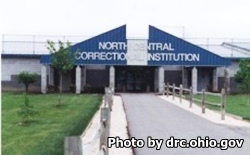 North Central Correctional Complex is a minimum security correctional institution located in Marion Ohio. It houses both minimum and medium security inmates. The North Central Correctional Complex is comprised of the main compound (formerly North Central Correctional Institution) and the camp (formerly Marion Juvenile Correctional Facility). In 2011 the facility transferred operations to a be a privately run facility by Management and Training Corporation. The camp houses only minimum security inmates, while the main compound houses medium and minimum security offenders. This prison currently houses about 2,720 inmates which is well over the designed capacity of 2,250. The demographic of inmate's at this prison is primarily white (59%) and 38% African American. The average term of incarceration for inmates at North Central Correctional Complex is 3.8 years. North Central Correctional Complex offers inmates vocational and educational opportunities in adult basic education, GED testing, welding, building maintenance, woodworking, plumbing, and culinary services. This prison participates in the prison industries program allowing inmates to work in data entry, and in a graphic shop working with the CAD computer program. Processing of visitors ends at 1:30pm.